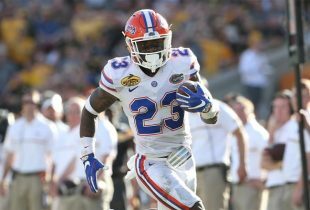 With just 30 days to go until the Florida Gators‘ 2011-12 football season gets underway, the seventh part of OGGOA‘s new series, The Countdown, takes a look at those players expected to contribute on the field wearing jersey numbers ranging from 39-30. Quick Bio: A three-star recruit coming out of high school, Jenkins majors in social and behavioral sciences and is entering his fifth season with the team after being seriously injured (head) in 2009 and also missing games one year ago. 2010 Season: Earned his first career start in the season opener, but hyperextended his left elbow and sat out the following seven games. Ended up earning two more starts and playing in four more games but only amassed 15 total tackles and one interception on the season. 2011 Outlook: Granted a fifth year of eligibility by the NCAA in 2010, Jenkins hopes to win a starting cornerback job opposite redshirt junior Jeremy Brown but will be competing with sophomore Cody Riggs among others for the opportunity. Quick Bio: A highly-ranked four-star linebacker in high school, McCray is a social and behavioral sciences major who has since shifted to defensive end. He played in 11 games over his first two seasons with the team but received a medical redshirt in 2009. 2010 Season: Back from injury, McCray played in 10 contests last year, missing three because of a sprained right ankle. His season highlight came in the Outback Bowl when he returned a blocked punt for a touchdown, but he also shined against Vanderbilt by registering a tackle, forced fumble and two hurries. 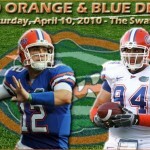 2011 Outlook: McCray will be competing to be one of the team’s primary starters at defensive end this fall. Senior William Green has one side locked up, and McCray that his athleticism and tenacity help him stand out from the pack for the other available spot. Head coach Will Muschamp, who put McCray at SAM linebacker at time during spring, also praised him for his leadership. “I love the new defense. You’ve just got to see it on the field. It’s a different concept, a different style of defense,” McCray said on March 21. Quick Bio: A three-star recruit who attended the same high school as redshirt senior quarterback John Brantley, Johnson enters the season as a versatile defensive back who gives Florida plenty of options. 2011 Outlook: “Chris Johnson from Trinity is a very physical player, in the box safety,” Muschamp said on National Signing Day. “He’s shown skills to play outside in the deep part of the field.” Johnson may not make much of an impact in 2011 beyond playing on special teams and is a candidate for a redshirt. Quick Bio/2010 Season: One of the top running backs in the country coming out of high school, he was a four-star recruit who currently majors in social and behavioral sciences. He appeared in two games as a true freshman in 2010, carrying the ball three times for 23 yards. 2011 Outlook: One of five scholarship rushers on the roster, Brown has a pair of seniors (Jeff Demps and redshirt Chris Rainey) in front of him as well as junior Mike Gillislee. He was broke his fibula during the spring but had successful surgery and was supposed to return to working out in July. Between the injury and the stacked depth chart, his potential impact in 2011 is up in the air. Quick Bio/2010 Season: An early enrollee last January, Christian was a four-star recruit coming out of high school, where he was teammates with fellow Gators safety Matt Elam and wide receiver Robert Clark. The social and behavioral sciences major played in eight games as a freshman on the field goal unit and in goal-line formations. 2011 Outlook: Muschamp worked Christian out extensively at linebacker in the spring (also giving him some time at tight end) but ultimately decided that offense was where he belonged. He said on April 21 that Christian had returned to playing tight end and fullback and would likely stick with that role. “He’s working awful hard. I’m very proud of his effort and what he’s trying to do,” Muschamp said. “He’s done some nice things for us at tight end.” Christian will have to compete with redshirt sophomore Jordan Reed (the likely starter) and four-star commit and early enrollee A.C. Leonard for playing time. Quick Bio/2010 Season: A four-star recruit coming out of high school, Riggs is a social and behavioral sciences major who is one of only six true freshman to play in all 13 games in 2010. He earned three starts (one in the Outback Bowl) and registered 18 tackles, three pass breakups and one interception. In addition to seeing plenty of time on defense, Riggs played as a gunner on the kickoff and punt coverage teams and had a solid first season in the Orange and Blue. 2011 Outlook: Muschamp said Riggs “had a great spring playing both corner and nickel” during a speaking engagement in April and said in March that he is the team’s most versatile defensive back. “Cody’s a good football player. He’s got a tremendous heart [and] all the ability as far as playing hard and playing fast and doing the things you got to do to be a good football player,” he added. With the loss of senior Janoris Jenkins, Muschamp may count on Riggs to start opposite Brown but could also use him in a variety of other ways. I say we put Moses at fs and leave mccray at lb with bostic and jj. Let the younger more athletic guys play corner and let elam/moses/evans partol deep. Why is every one of our players a social and behavioral sciences major? For the younger ones, many don’t declare majors right away (I didnt) so that probably puts them on some path academically. The older ones either stuck with it because it’s easy or don’t care to change (or enjoy it). Cody Riggs looked like the gamer last year and the dividends will pay off down the road if he gets the starter’s role over Mo Jenkins or Brown this season. McCray needs to have a big year for the defense to be successful. I hope to God, Moses Jenkins doesn’t start. He was a skid mark in the FSU game last year.